John Humphrys has been described by assorted national newspapers as “the most ferocious and insightful interviewer of his generation”; “the most feared inquisitor in the land”; the “outstanding radio interviewer of the past decade” and “a unique figure in national life.” He’s even been described (by The Observer) as “cool” … which comes as a huge surprise to his children… and (by the Sun) as a “legend”, which comes as an even bigger surprise to him. But not everyone approves of HOW he has changed it. He is occasionally attacked by the politicians he meets across the Today studio microphones. One former Conservative Cabinet Minister accused him of “poisoning the well of democratic debate” with his style of interviewing. 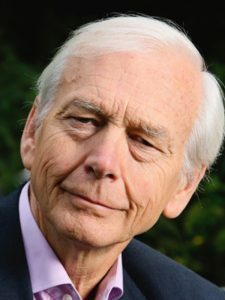 The Labour Party dubbed him “the John Humphrys problem” and wrote to the BBC to say “something must be done about him”. On both occasions the BBC was swamped with letters of support. Most said he was not the PROBLEM, but the SOLUTION. Apart from his broadcasting work John writes books and newspaper columns and has set up his own charity: the Kitchen Table Charities Trust. He also presents that rare programme: a serious television quiz show, Mastermind. The subjects of his books include the abuse of the English language, the question of whether God exists, social change in Britain, assisted suicide, food and how not to build a house in Greece. Quite a range!